Who doesn’t like free traffic from Google? I do and I am pretty sure you fancy a lot of traffic coming to your website from Google as well. And a thorough keyword research is probably the best way to get it. Obviously, if all your website content is wrapped around keywords that boast a high search volume, you are bound to receive some extra traffic. Moreover, merging the power of digital marketing with your keyword optimized content will have you reaching new heights of exposure and traffic coming to your website, which is never a bad thing for your business, right? Think you don’t have the required knowledge or time to conduct a proper keyword research? You’re wrong! It could have been the case 10 years back but in this tech-savvy world of today, doing keyword research is a piece of cake. How? By using the best keyword research tools out there. As you would have guessed it from the title, we will be diving deep to research the best keywords in both Ahrefs and SEMrush – which are undoubtedly the best keyword research tools out there.. But first, we need some keywords before we begin with our actual research. 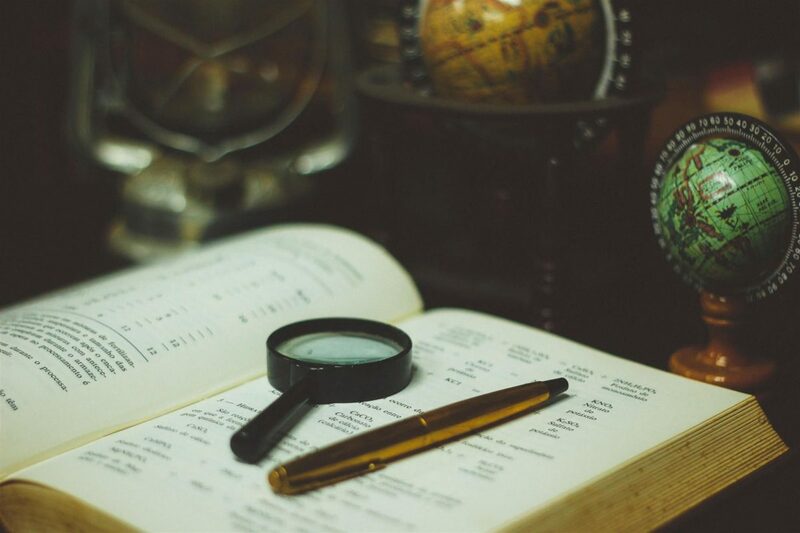 If you are doing keyword research for a client or doing it for your own product, knowing who and what a website serves to its visitors is a crucial step in finding some relevant seed keywords. You can have a look at the title tags and H1 tags of any webpage to get a gist of the keywords to be chosen. It’s important to get into your user’s shoes and think about their intent when searching for your services online. Say, a searcher wants to buy ‘shoes’. His searches would be something like this – ‘nike shoes’, ‘casual shoes’, ‘best formal shoes’ or something similar. So, if you sell shoes, it makes sense to add these search strings to your keyword list. You might need around 30-40 apt keywords for your research. 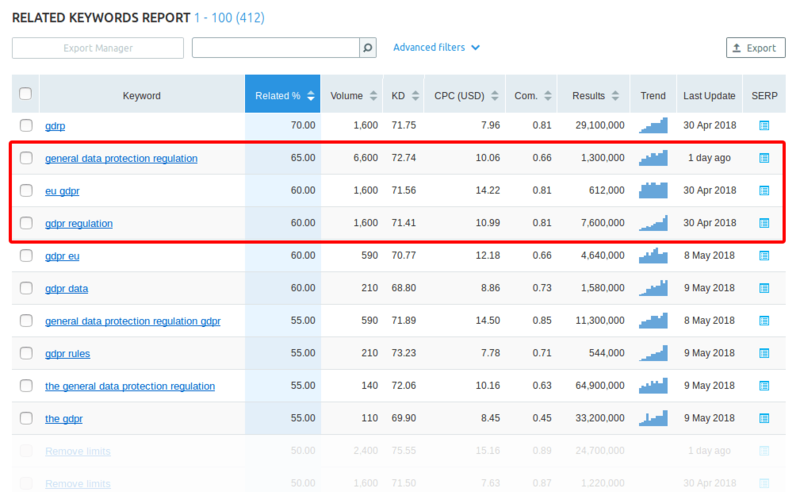 And using a tool like Keyword Planner can come in handy when searching for keywords with high search volumes. But using Keyword Planner requires a Google Adwords account which can be a trouble if you don’t have one. Don’t worry though, there are other tools that deliver this functionality as well. And probably the most used keyword finder, after Keyword Planner, is Keyword Tool. The search resulted in 538 unique keywords for the query. You’ll need the paid version to get the metrics as well but we won’t be needing them as all the data will be exported to Ahrefs. Now, combining the keyword results from the above-mentioned methods, export them to an excel sheet and delete some that you deem irrelevant. Copy and paste the keywords to Ahrefs or SEMrush to begin your quest of choosing the best keyword. Both of these tools are great. Both are quite similar in pricing as both the tools offer a basic subscription of $99 and provide almost the same level of functionality (limited in free accounts) but all the difference lies in how they present data to users and that can sometimes make all the difference. 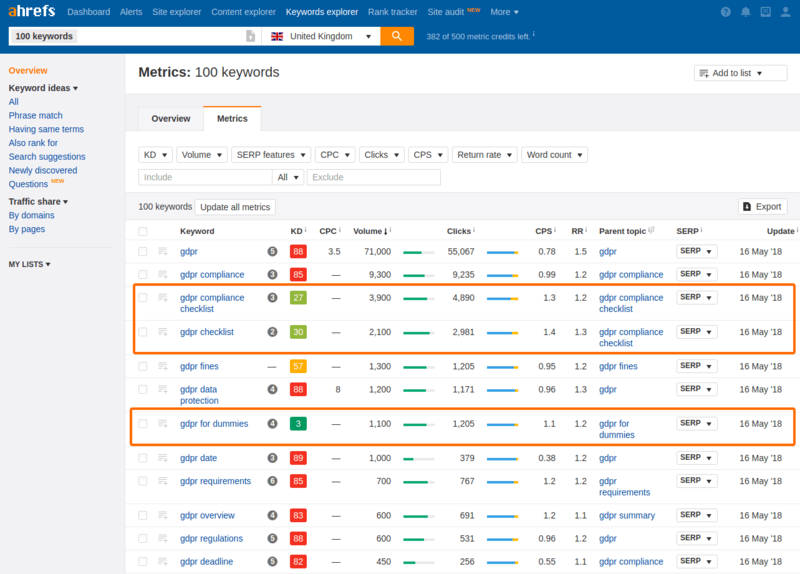 I personally like Ahrefs more because of the sheer simplicity of the platform when it comes to keyword research and they also present their data in a more intuitive way (which you’ll see through screenshots as you’ll further read this blog). Which is probably the reason why we use it for our SEO purposes as well. But the only downside of using Ahrefs is that they don’t provide a free account. In the remaining part of this blog, I will be telling you how to research keywords both on Ahrefs and SEMrush so it completely depends on you which tool you want to use and spend your precious marketing budget on. Keyword difficulty – Ranked from 0 to 100, it is an estimate of how hard it will be to rank in the top 10 of search results. SERP Features – This metric shows us the different SERP features present on the search results such as Ads, top stories, related questions, AMP carousels etc. Cost per click – It is an estimated cost-per-click value of a keyword. Clicks per search – Shows how many search results people click on for a particular keyword. Return Rate – Tells us how often search for a targeted keyword again. Go to the ‘Keywords Explorer’ tab and paste your sheet containing all the remaining keywords on the search tab. You’ll be limited to a hundred keywords here. So, make sure you paste the best of the bunch. This is the overview page. It gives an idea of the total search volume and clicks of your chosen keywords. But this is not where the gold is. 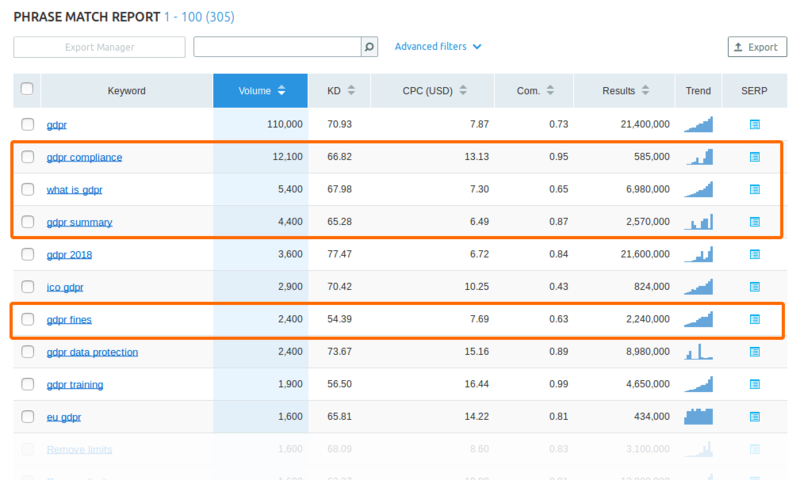 To get a better idea of which keywords to choose, we will click on the metrics tab to get a better idea of how each of the keyword is performing on the SERPs. 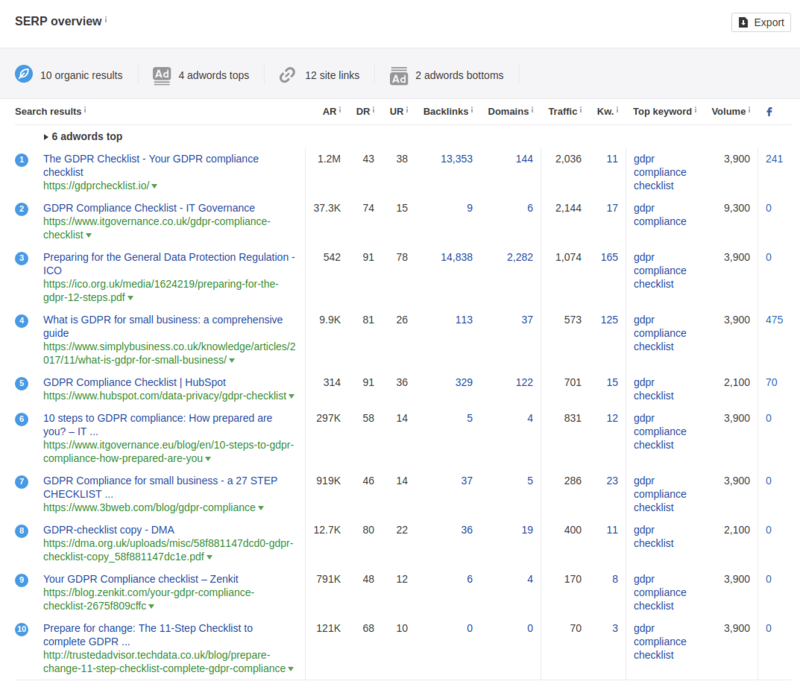 On the metrics tab, you get detailed information of all the searched keywords. Of all the metrics, you need to primarily focus on Keyword difficulty, volume, and clicks. In this case, those money keywords will be ‘GDPR compliance checklist’, ‘GDPR checklist’ and ‘GDPR for dummies’. So, if you were to write a blog about GDPR, ranking for these 3 keywords would be enough to get to the first page of Google as there’s not much competition. But there will still be some publisher ranking on the top spot for all these keywords and having a look at what they have done to reach to the top can give you an idea of what you need to do better to outrank them. Ahrefs provides for this as well. When you’ll further click on a keyword, it will give you an overview of the keyword with all its metrics and it’s SERP overview. 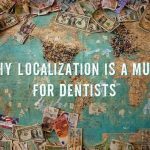 Having an idea of what content already is out there gives you an opportunity to put on your creative hats and provide the kind of value to searchers that isn’t available yet, which I think can give you a certain edge. Ahrefs and SEMrush are on the same level when it comes to functionality but to unleash the full potential of SEMrush you’ll have to spend some bucks on its subscription (just like Ahrefs). But the good part is that SEMrush lets you play with their tool ‘a little’ to get a gist of how it functions. If you are unsure whether to spend your marketing budget on the platform or not, I seriously recommend you to test their platform before making the final decision. You’ll be limited to 10 searches per day in your free account which I think is just enough to get a feel for the software. 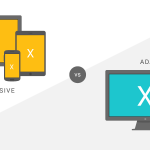 Note: Both the platforms are different in how they search for keywords. 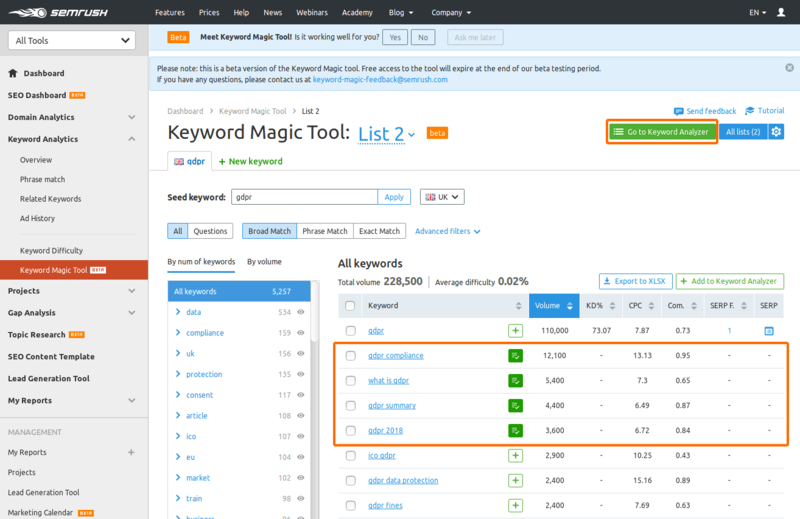 While Ahrefs can search for multiple keywords (100 max) in one go, SEMrush can search for a single seed keyword at a time and kills the need to use the keyword tool we mentioned earlier. Just go to their website and search for a seed keyword you want to rank for. In our case, we will go with the term we chose for Ahrefs – GDPR. After you click ‘Start Now’, you’ll be redirected to it’s ‘Keyword Overview’ tab in ‘Keyword Analytics’. But we searched for a seed keyword and not keywords which we will be actually wrapping our content around. For finding keywords that have some untapped potential, you’ll have to click on ‘Phrase Match’ and ‘Related Keywords’ tab to get more results. You’ll be limited to 10 results while using a free account. You could’ve played with their filters and stumbled upon the most relevant of keywords for free but SEMrush now requires that you pay to add filters as well… sigh! So, you’ll have to choose the best keywords from those 10 results based on the same metrics we chose in Ahrefs. Go for the keywords that have high search volume and low keyword difficulty. 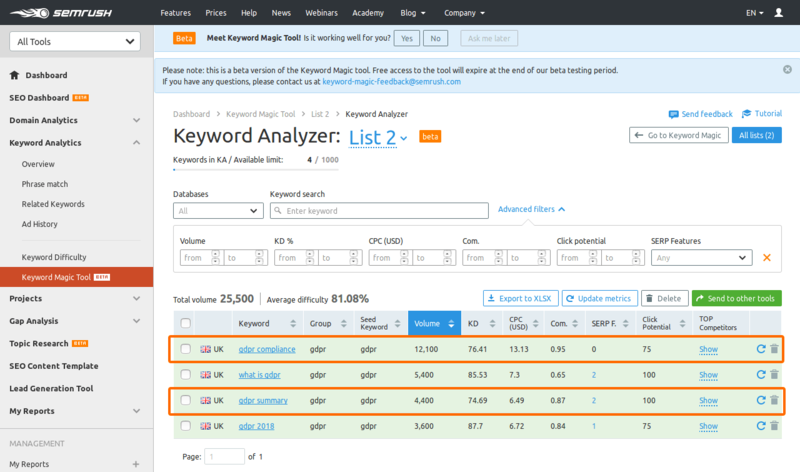 With a free account, unfortunately, that’s all that you can do with SEMrush when it comes to keyword research. Now, we move on to the better things…. With a paid account, you’ll be able to see all the results there are in the searches we did above on the free account. 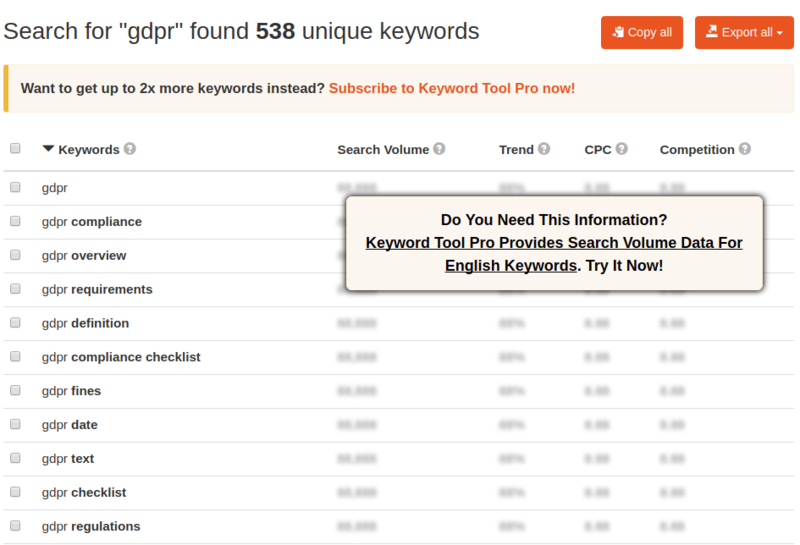 Other than that, you’ll get access to it’s ‘Keyword Magic Tool’ (beta)…. sounds interesting, doesn’t it? But what exactly is it? 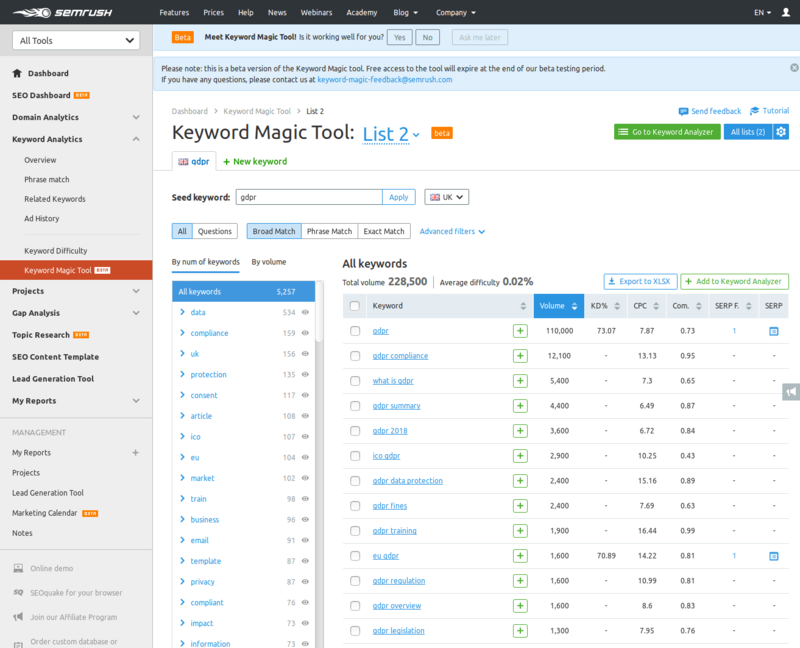 Just go to the ‘Keyword Magic Tool’ tab and search for the seed keyword you want to rank for. Which in our case is… yep, you guessed that right… GDPR. Once you search for your seed keyword, it will automatically create a list and show you all the keywords there are that relate to the seed keyword in any way. Bear with SEMrush for their blank metrics as this feature is still in beta. The next step that comes in our keyword research using this new feature is to select the best keywords and adding them to ‘Keyword Analyzer’. To do that, just click the green plus sign beside a keyword to add it to the Keyword Analyzer list for further research. Once you’ve selected the keywords you like, click on the green ‘Go To Keyword Analyzer’ button on the top right. And you’ll be redirected to the Keyword Analyzer tool which will place all the selected keywords together with all its metrics. You can further decide the final keywords to choose from here. 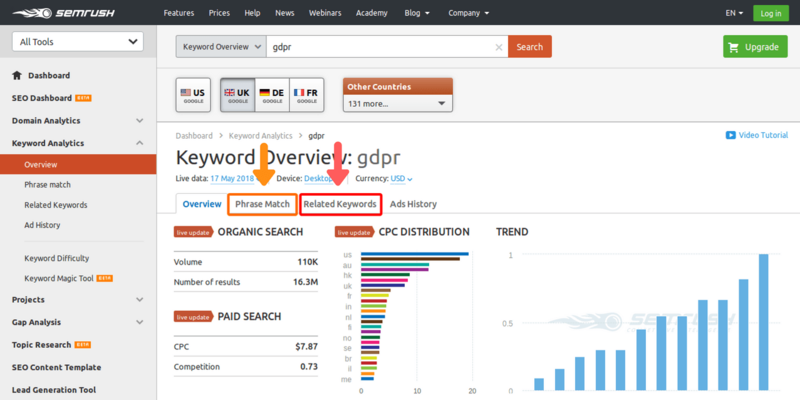 In this case, I chose ‘GDPR Compliance’ and ‘GDPR Summary’ as the chosen keywords as they have a lower keyword difficulty than others so it will be easier to rank for these keywords. And with this, we are done with finding the perfect keywords in SEMrush as well. After using both the platforms, we have finally stumbled upon 5 keywords full of opportunities. If I was to select a title for my blog on GDPR, using all the keywords, it would look something like this – ‘GDPR for dummies: Your GDPR compliance checklist is here!’ and the blog would summarize the whole GDPR thing to make use of the ‘GDPR Summary’ keyword as well. Like I said before, with all these advanced tools at our disposal, keyword research is not what most of the business owners and marketers think of it. Doing keyword research with the help of Ahrefs or SEMrush will hardly take you 20 minutes and you’ll be on your way to creating highly keyword focused content that will bring in traffic for a lifetime.. a lot of it! Hopefully, with the help of this guide, you’ll find using these tools a lot, lot easier!